Meningitis is a serious medical condition in which the membranous tissue (meninges) that surrounds and protects the brain and spinal cord is infected, according to the Mayo Clinic. There are two types of meningitis: viral meningitis, which usually resolves on its own in a few weeks, and bacterial meningitis, which can be life-threatening. Fortunately, a meningitis vaccine is available to prevent bacterial meningitis. As with all vaccines, you should be aware of possible side effects. According to Drugs.com, a severe weakness or unusual feeling in your arms and legs are serious side effects. This side effect can occur immediately after the injection or it can develop 2 to 4 weeks after the injection. If you are experiencing weakness or unusual sensations in your arms or legs, you should consult a doctor immediately. Fever and chills can develop after receiving this vaccine, according to Drugs.com. Consult your doctor if you are experiencing these effects. Drugs.com states that unusual bleeding is a serious side effect of the meningitis vaccine. This includes excessive bleeding or bleeding that does not easily stop. In addition, excessive bruising can be a sign of unusual bleeding. If you are experiencing this side effect, consult your doctor immediately. A common, but less serious side effect of the meningitis vaccine is pain, swelling, redness and a lump at the injection site, according to Drugs.com. You may be able to alleviate these symptoms by applying ice to the injection site for 20 minutes. Wait 20 minutes after removing the ice pack, and repeat as necessary. Consult your doctor if these symptoms do not resolve in a few days. 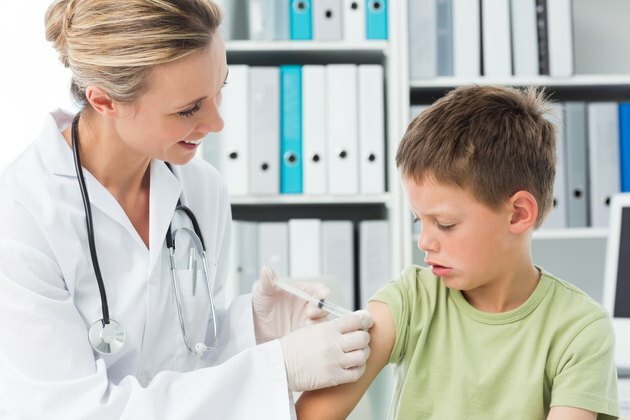 Drugs.com states that headache, fatigue, joint pain, diarrhea, vomiting, loss of appetite or mild skin rash are less serious side effects of the meningitis vaccine. If these symptoms do not resolve after a few days, alert your doctor.